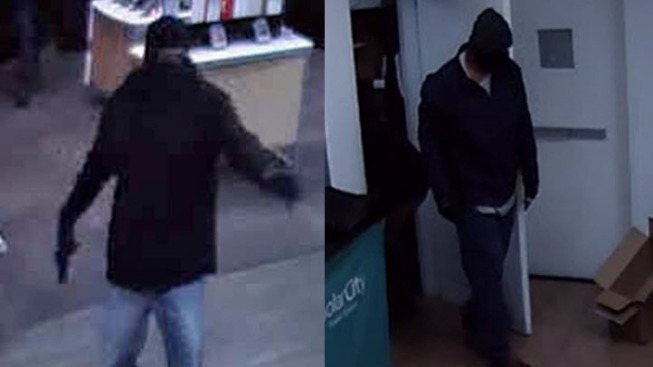 Police are seeking two armed suspects who robbed a Palo Alto cellphone store Saturday evening, just as the store's employees were getting ready to close, according to police. At around 7:15 p.m., an employee at ClickAway Palo Alto located at 2999 El Camino Real said an armed robbery had just occurred about 15 minutes earlier, police said. The employee said two masked men entered the store just before closing time. One suspect was armed with a gun while the other had a knife, according to police. The suspects then forced the employees into a back office. The men took a number of new cellpones as well as cash from an open safe, before fleeing through an employee entrance. Employees said they didn't hear a vehicle leaving from the parking lot. No customers were in the store at the time and none of the employees were injured, police said. The employees waited at least 10 minutes to call police, as the robbers instructed them to do. The suspects were described as two young Black males, both tall in height. They wore gloves, hooded sweatshirts and ski masks, covering their faces, according to police. A surveillance camera at the store was able to capture images of the suspects. Anyone with information about the incident is asked to contact the Police Department's 24-hour dispatch center at (650) 329-2413. Anonymous tips can be made by voicemail at (650) 383-8984 or by email at paloalto@tipnow.org.